Downtown Disney is currently going through an overhaul to become the new and improved Disney Springs. When the announcement of Disney Springs came out, so did information on The BOATHOUSE. 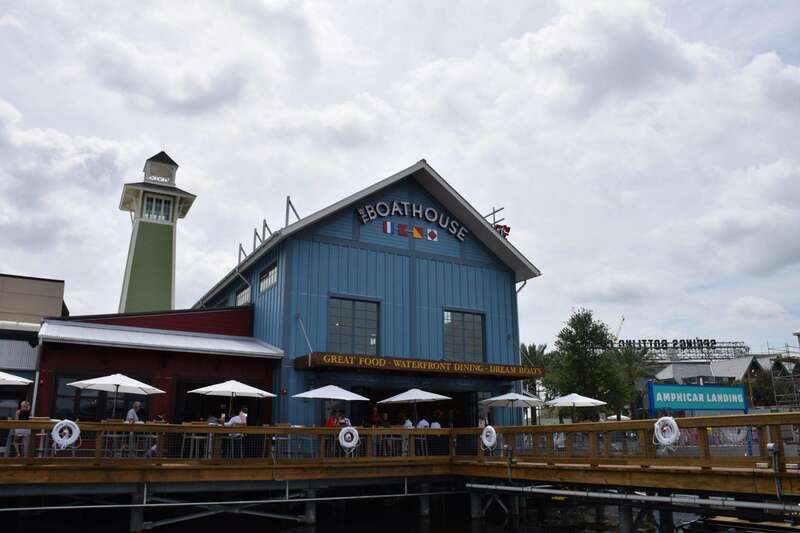 I had the opportunity to check out The BOATHOUSE, ride on the Amphicars, and do a full food review on the amazing food! In case you want to check out my time on the Amphicars, check out the article here! When the news first broke, I had a chance to interview the creator of The BOATHOUSE Steven Schussler. To check out the concept and hear the interview, check out my article here! First off, the atmosphere at The BOATHOUSE is amazing! From the moment you walk in, till the time you leave you you are surrounded by amazing artwork and pieces of boat materials in a upscale restaurant. 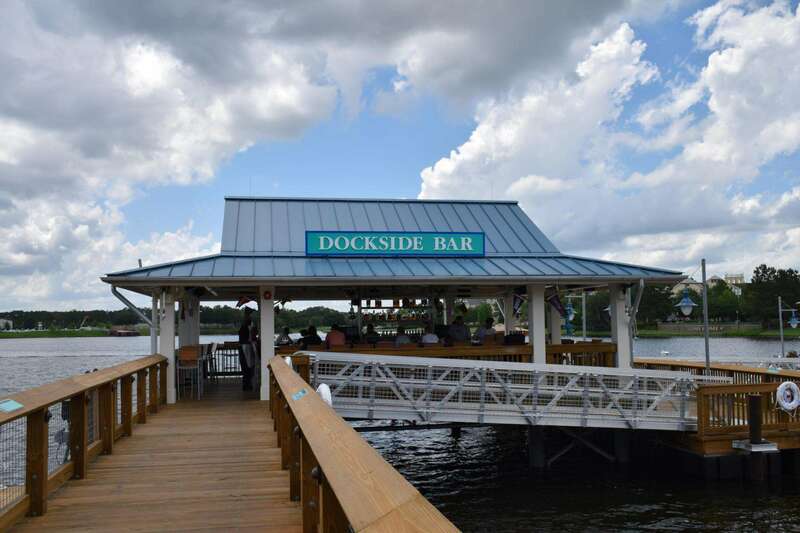 There is 3 different bars at The BOATHOUSE, one of which is outdoors on the water. The restaurant itself is also set up in 3 different areas. As you work your way to the back of the restaurant, so does the theming and the atmosphere. The BOATHOUSE is also unique as it is the first restaurant to embrace the amazing view on the waterfront. 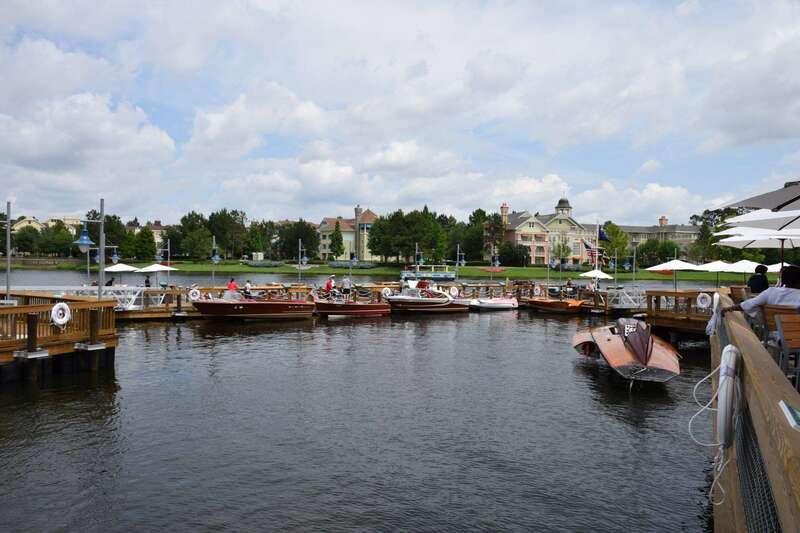 Speaking of the water, if you go out back where the outdoor bar is, you can enjoy some of the awesome antique and famous boats that are on display. 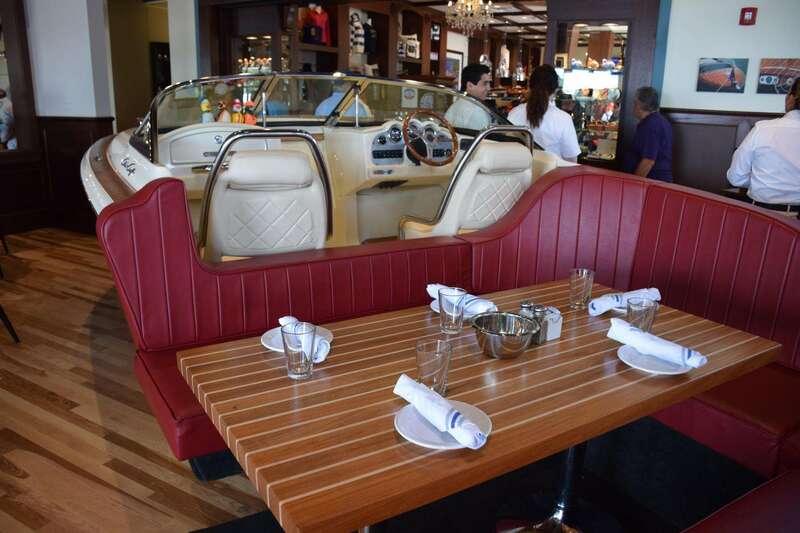 This restaurant is not only a great place to eat, a sweet place to ride in an amphicar, but also a floating museum! I started out my lunch with the Firecracker Shrimp. This dish included Laughing Bird Shrimp, Sriracha Mayo, and Shishito Peppers. 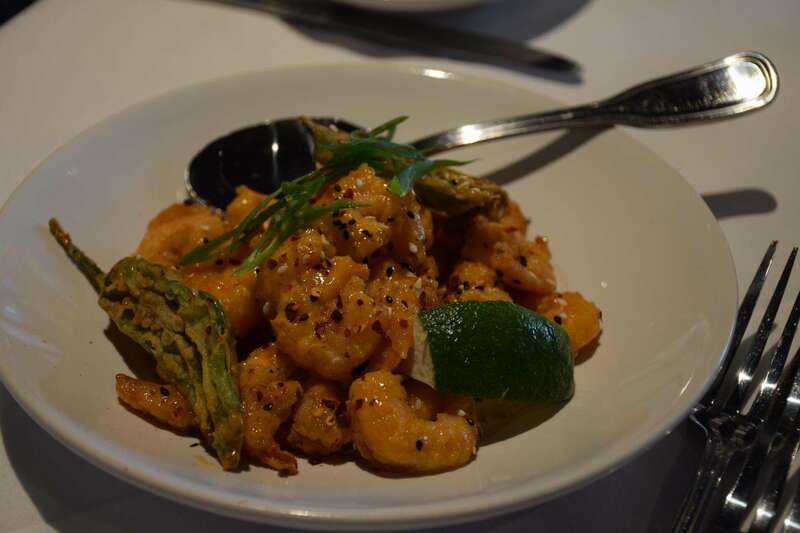 This dish was large enough to share with a friend and full of flavor. The large shrimp were great quality and you could tell were fresh. The sauce on the shrimp had a bit of a kick with just the right amount of heat. For a main course I decided to have the 8 ounce filet with provisions oscar style. 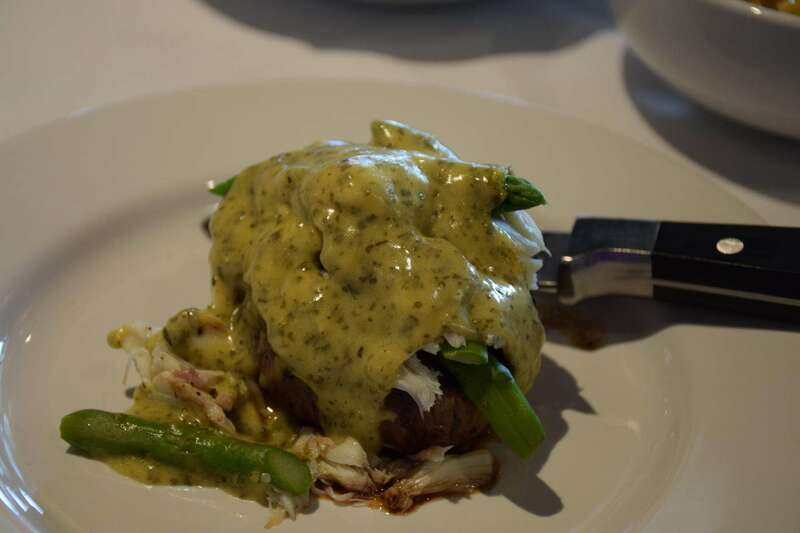 This steak was topped with jumbo lump crab, grilled asparagus, and smothered in béarnaise sauce. Before I describe just how amazing the steak was, I need to tell you about the USDA Gibsons Blue Star Heritage Angus. Gibsons is the only restaurant group in the US that has it’s own USDA selection process for beef. This process is much higher than most restaurants you will ever eat at ensuring that these steaks are top quality for you. Gibsons also makes sure it ages their steaks from 14-28 days to bring out the flavor and quality. Now that I have described the selection process, you know what I am going to tell you about the steak! The steak was super tender with great flavor. The crab meat was huge and tender with a great butter flavor. The asparagus and sauce only added to the flavor of this steak. 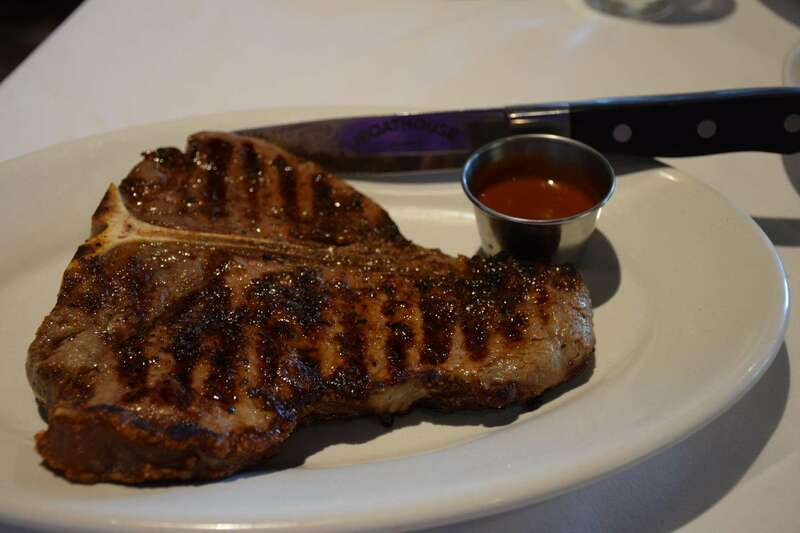 My buddy had the 20 ounce T-Bone steak with their homemade steak sauce and he assured me that the steak was the best steak that he has ever had before! For sides I had Shrimp and Andouille Mac’ n Cheese and the roasted sweet corn off the cob. 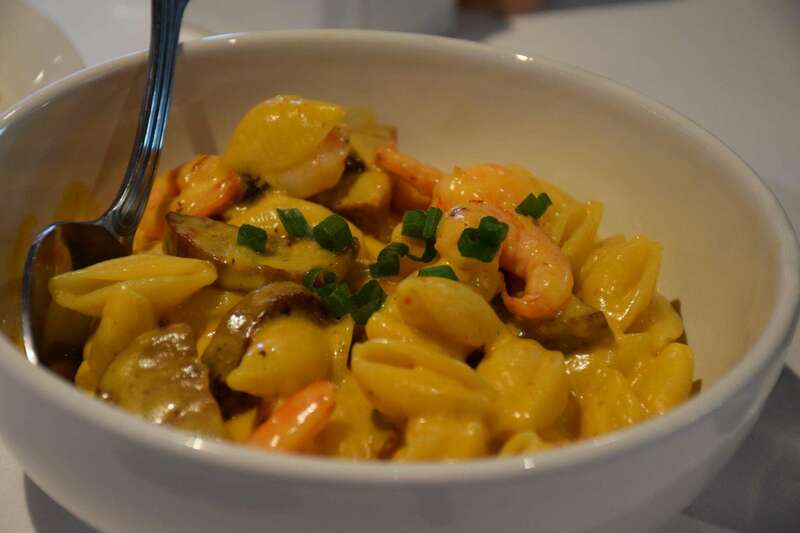 The Mac’ n Cheese was very flavorful and incorporated a good portion of both shrimp and sausage in every bite. The corn was unlike any corn I have had before and had me hooked from the first bite. 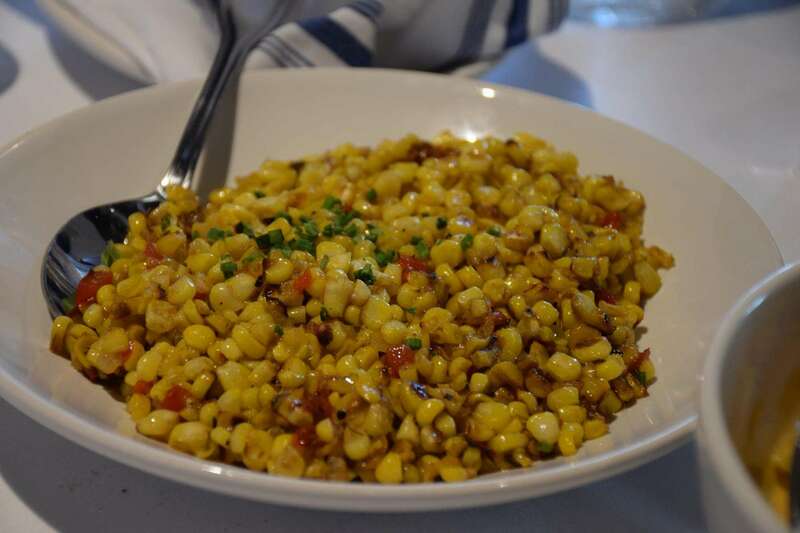 Im not sure exactly how they got corn to be so tasty but I tip my hat to the chef for sure! For dessert I had the whiskey caramel cornbread cake with fresh berries. This dessert was hard for me to choose due to the fact that I have never had cornbread cake but I am happy I took the chance on this dessert. 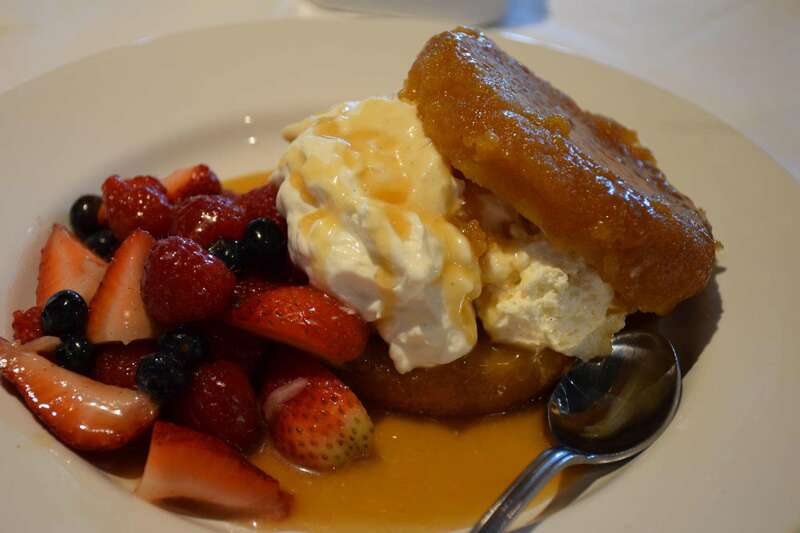 The dessert had two cakes made of cornbread that was soaked in a caramel whiskey sauce with whip cream and fresh berries in between. The cakes were moist and the berries gave it a bit of tart in the bites. I loved the dessert for sure! Overall what did I think of The BOATHOUSE? 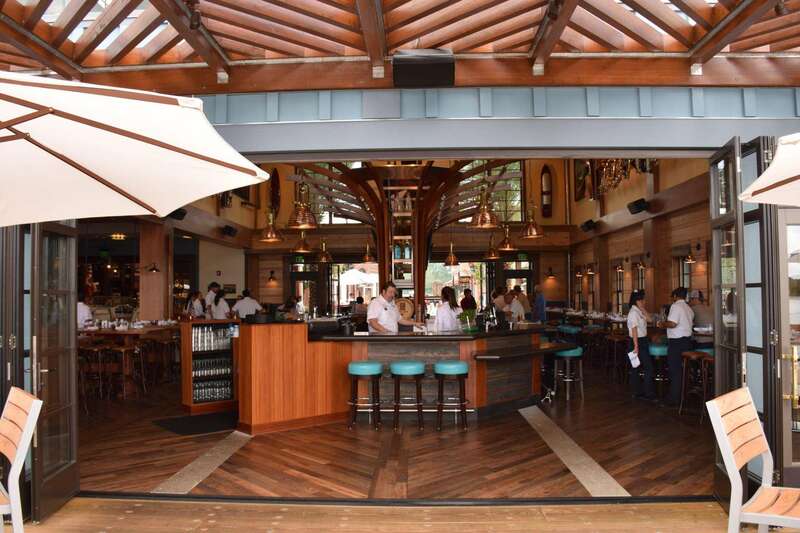 First the theming alone made this a must see restaurant at Disney Springs and Walt Disney World as a whole. I love how the incorporated both the boats and the fact that they are on the waterfront. The food was some of the best food that I have had on Disney property hands down. The steaks were great quality, the seafood was some of the freshest I have ever had (so fresh that it changes daily based on what was caught) and the sides were complex yet tasty in their own right! Add the fact that attached to the restaurant is a museum, great gift shop and the Amphicars and you have a winner in every aspect of your restaurant! I know that I will be back to The BOATHOUSE soon for some more amazing food! I want to thank both Mr. Schussler and the entire staff at The BOATHOUSE for having us out for a review! Make sure when you are in Orlando to go check out this must do restaurant! For more information on The BOATHOUSE, check out their website here! Have you been to The BOATHOUSE? Comment below and let me know how you thought it was! If not, will you be trying it next time you are in Orlando? Why or why not? Previous Post Disney’s TOMORROWLAND Ready To Be Box Office Hit!